Primitivo is a dark-skinned grape variety typical of Puglia. It is known to be genetically equal to Zinfandel, which has become one of the most widely planted grape varieties in the western United States. 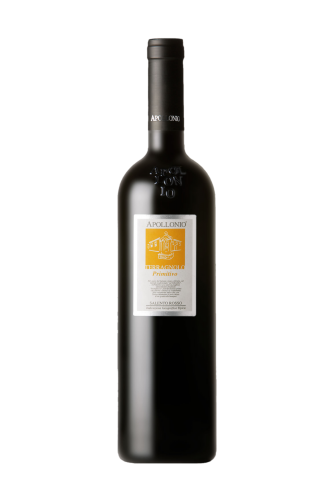 Primitivo translates roughly as ‘early one’ which is thought to be a reference to the variety’s early ripening nature. 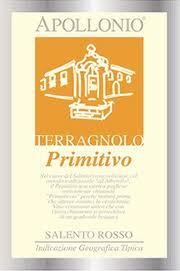 ‘Terragnolo’ Primitivo is sourced from 20-year-old bush vines. Trunks are kept short, approx. 40- 60cm from the ground, hence the name ‘Terragnolo’ meaning ‘close to the ground’ (terra in Italian). Grapes are harvested by hand when the bunches are fully ripe. A slightly later harvest guarantees fuller structure and higher concentration of sugars. Ruby red in color, Apollonio’s primitivo has lively notes of ripe fruit and spice on the nose which transfer to the palate sensation quite pleasantly. It is full-bodied with fine tannins and a generous long, fruity finish. Because of its bold structure, this primitivo will pair well with roasts, red meat stews, lamb dishes and parmigiana di melanzane. Grapes are harvested by hand when the bunches are fully ripe. A slightly later harvest guarantees fuller structure and higher concentration of sugars. Traditional temperature-controlled fermentation in large wooden vats (12,500lt in capacity) for 30-45 days. 12 months in American oak barrels and 12 months in bottle.